All Cecil E. Craigo hang glider notes are invited. Interface with other hang glider inventors, thinkers, builders? Hungry for information on him. I do not want to confuse him with others of same name. Our Cecil E. Craigo was from Whittier, California. He knew Harry E. Rollins of Garden Grove, California. 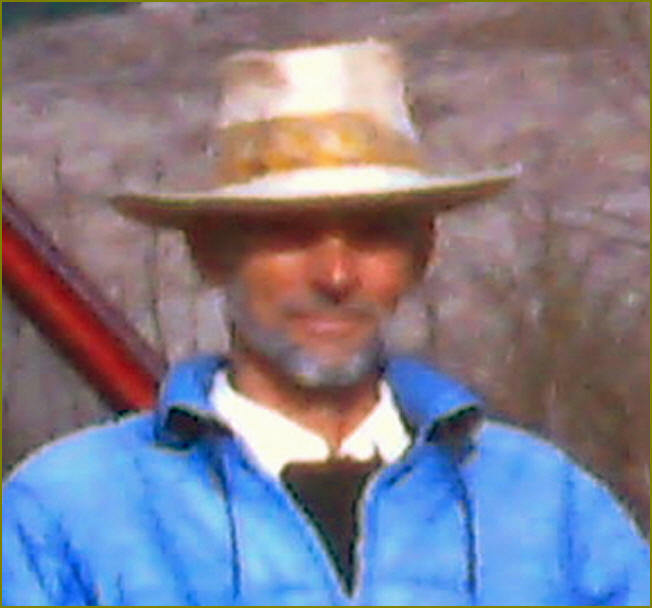 Note: Jim Hobson of late, pioneer seed-man of recreational hang gliding in 1962 with the Rogallo Hang Glider he publicized, was happening HG-wise about the time of some of Cecil E. Craigo's work on the flexible-wing hang glider. point with Cecil E. Craigo and Harry E. Rollins co-inventors on a flexible-wing focused patent. Cecil shows earlier in flexible wing development, which will be shown. The drawing in the 1965 files seems to echo some earlier work by John Worth ...several years, where the Worth A-frame is stark in the stiffened Rogallo Wing hang glider, as was that in James Hobson; this topic thread on Cecil should expose some of these matters. The patent right now linked does not show the front view of the A-framing to the platform, but just the side view. The towing lines are bridled to the payload platform where goods, human litter, or live humans could be placed. Years earlier Worth demonstrated some of similar for Francis Rogallo on the field. CAUTION: I do not know if the "Jr." is our man or not. And the following data may or may not be our guy; but I will state it as a matter of discerning research; maybe someone will find distictions and verification; thanks. MAYBE or MAYBE NOT: Cecil E Craigo 1894 - 1988 was a member of the Craigo family. Cecil was born on July 23, 1894. Cecil died on May 17, 1988 at 93 years old. Cecil E Craigo's last known residence is at Charleston, Kanawha County, WV (West Virginia) 25306. Confirmation of vital data. Distinguishing him from others of same name. Cecil E Craigo's last known residence is at Charleston, Kanawha County, WV (West Virginia) 25306. THERE MIGHT BE A FATHER AND SON DEAL; NOT SURE. In the topic thread on Cecil E. Craigo, it would be neat to collect names associated with him; this would enhance research on Cecil. So here are some, and some later in further posts as time goes. The group of engineers---because of the leadership of Francis Rogallo in their hearing and association---were understanding the four-boom hang glider wing as utilizing the "stiffened" aspect of the flexible-wing patent of Rogallo, even though stiffened wings of similar structure were non-Rogallo merit; but it is of merit and note that the leadership of Francis Rogallo into stiffening of his core invention of the flexible wing brought about further technology where there was a "Rogallo Revolution" as was noted in media; the vast amount of patents in that period, not all, were referencing the stiffened Rogallo Wing. In our forum we will be covering teachers that did not reference Rogallo, but it can be shown that the flow from the leadership of Francis Rogallo was still what was prompting attention on the four-boom flexible wing, as well as many forms of the pure flexible wing rooted in Francis Rogallo. FLEXIBLE WING CARGO GLIDERS. DESIGN CRITERIA AND AERODYNAMICS, VOLUME II. Authors:	J L King; J E Fink; C E Craigo; RYAN AERONAUTICAL CO SAN DIEGO CA. Publisher:	Ft. Belvoir : Defense Technical Information Center, 15 SEP 1962. See next post for continuation of attachments about same document o 1962. ... continuing about the same document of 1962. The 310 page document was distributed very widely. The document lists all the places that received copies of the document. The tow and drop glider tests won contract to go further. ground and air characteristics of Flex Wing manned test bed. So to the list of people associated with Cecil E. Craigo is now placed the famous pilot Lou Everett who placed big in media for the Rogallo Revolution. That should be helpful in finding more on him. Ryan Reporter had been a strong publication for Ryan Aeronautical Company. i am looking into one issue for Cecil E. Craigo photograph. http://ia600308.us.archive.org/24/items ... 63ryan.pdf Large file. 38 MB. Pages: 460. I will sift it for our Cecil E. Craigo. That photo is from Vol. 23, Feb. 1962 issue of Ryan Reporter. That issue had a major article in it titled "The Versatile Flex Wing" starting on page 6 with many illustrations, but not illustrating all that was known and in public domain technology-wise. It was already old hat about the application for foot-launching; Palmer had already foot launched. Rogallo had already communicated strongly the application of hang gliding for the fully flexible and the four-boomed stiffened Rogallo wing. to the wing's center of pressure." is pretty clearly the same control mechanism used by most hang gliders today. The Craigo, et al, patent has on it a reference to Spratt's US 2128060 that carefully teaches moving CG relative to wing attitudes (Spratt actually built and used A-frame in an aqua-pontooned hang glider early on; lots of photos of such online); such actually mechanically teaches what was exhibited in a much earlier patent by Gustave Whitehead for hang gliding; and all such baby steps through the mechanics that were actually used in the hang glider of 1908 in Breslau that exhibited the exact simple cable-stayed A-frame for moving by the hung pilot in a battened sailed hang glider (yet such was not the only early case instructing the hung pilot with moving airframe by touch of downtubes and basebars. Igor Bensen was only using the same mechanical control arts--that were in public domai--in 1953 and 1954 as he used in kited gliders: the A-frame mechanics and single-pint hang; JD, before his tinkering with the stiffened NASA Rogallo wing kite, had actually used and was involved with Bensen kite-gyro glider world, and so used the very mechanics of control---single-point hang and control-wing by manual moving of airframe (hence making even more silly to later via GH to try to claim "invention" over such; real slap to Bensen and earlier meriting users of public domain mechanics). All such makes silly the GH-JD push of "invention" over such matters; and makes silly anyone's rubberstamping (low-scrutiny by FAI, HGFA, USHPA, writers, bloggers, etc.) the same untenable claims so late in the game of crafting. The NASA and Ryan people were rehearsing much prior art as they tweaked craft for special missions; the underlying invention for control had already been placed into public domain--and hence--common art for those skilled in the arts. Someone unskilled in the arts picking up adaptations only to tinker mechanics that are common property to humankind have no just right to own the face of "invention" for what was only tinkered up to use public property; when such untenable "owning" becomes the leading face of hang gliding, then the question arises: will that hang gliding community have integrity and action investment enough to mend its face? The GH first article had over ten clear untenable claims; over time GH went in and out of further untenable claims, like "single-point" hang, and A-frame ... both of which were extant in hang gliding very early and many many decades before the JD tinkering. Will the hang gliding community apologize for itself and improve its respect for the creative history that is robust? Or will a very untenable flat face be the consensus? So far, the FAI CIVL seems incapable of righting actions without a groundswell from the ranks; and I do not see any groundswell occurring to right things smashed by the GH-bully result; the "power" of the FAI is being abused; and by such abuse the FAI is losing some charter soul; and by such, the org may fade itself out of relevance; personal flight is taking a sad hit by the FAI inaction to correct its complex processes that injure the creative space of hang gliding; big hammer smashing hang gliding history; it seems the FAI does not care, as it seems it feels like it can get away with low-scrutiny and stay in La-La Land holding the power stick. The titled face has emerged in a recent video by USC student video approved by department; we are talking with them now about a slide in the video that answers a question posted by the student producer; the slide has JD as the "inventor of the first hang glider." In two seconds, a counterexample can be found. Such untenable face stems from the GH yelling bully campaign for untenables. FAI is simply burying its head in the sand and going on as if everything is fine in hang glider worlds. Maybe one day there will be a huge hang gliding community that does not at all interface with the FAI or USHPA or HGFA. A community that has hang gliding lift their lives to the skies for a few seconds or hours fully aside from orgls and insurance-companies' and manufacturers' face forming. Maybe several types of hang gliding communities will live. I do not want to live in the present FAI community, as it is smashing its creative soul into flatness; considering alternatives is an investment that will take me to unknown territories. Live and let live. It may be soon that I simply have zero marbles in any FAI game; similarly for the complicit HGFA and USHPA. Miller has been turning over in his grave because of the flat face that GH pushed and orgs have accepted. But Miller still inspires many today. Ryan Flexwing test circa 1960. Courtesy of San Diego Air and Space Museum Archives. Author:	Ryan Aeronautical Company. ; United States. Air Force. Systems Command. Aeronautical Systems Division. Publisher:	San Diego, Calif : Ryan Aeronautical Co., . Series:	Report (Ryan Aeronautical Company), no. 65B021. This report presents the results of a program conducted to determine the capabilities of the Ryan 2000 Pound Payload Flex Wing Prrcision Delivery Glider System. The concept of using a Flex Wing glider as a precision aerial delivery system has been previously demonstrated by this contractor under controlled flight conditions for sized wings from 10 to 30 feet in length. One of these systems, a 300 pound Payload Precision Drop Glider, has been successfully demonstrated and evaluated in Southeast Asia, where the system performed simulated operational missions. Ever to keep in mind how Francis Rogallo demonstrated hang gliding in late 1950s to NASA personnel in a hangar, besides disclosing the application to hang gliding for the limp and stiffened flexible wings. Invention for the application hang gliding was not being claimed, as that would have looked as silly as it does by anyone failing to recognize that the application of "hang gliding" for sailed wings was extant in and before 1800s, and certainly starkly in the last decade of 1800s. Testing was being carried out in the airs at Marine Corps' desert facility in Twenty-nine Palms, California. File comment: Cecil E. Craigo with one of his team's projects noted by The Press in Torrance, CA, in Sunday issue of The Press newspaper, page A-3. In January issue of Popular Mechanics of 1963, yes, the first month of 1963, some many months after James Hobson flew Rogallo Wing hang glider airframed with A-frame at Dockweiler Beach, California. The international-affecting Popular Mechanics magazine rides the already occurring "Rogallo Revolution" with their article noting the "sport" aspect of the flex-wing ...now standard for tinkerers, as Palmer and Hobson seeded things starkly already by then with foot-launching hang gliders of the four-boom manner. Hobson put his on national TV in the prior 1962 year. In 1962-3 Mike Burns was scratching in models and full flight the four-boomer stiffened Rogallo flex-wing affair. Recall: since first decade of 1900s hang gliding community had A-frame and single-tethered pilot in battened sail hang glider, and more. Stand up for your rights and do not let FAI and USHPA and HGFA make flat your rich history just because one guy can yell well for a guy he has in tunnel vision. Flightsail. The herein clip suggests that readers also see the November, 1961, issue of Popular Mechanics for the Everett article on another use of the public-domain wing where power off one gets a type of hang gliding. Click image for source article in PM. Craigo was working with public-domain technology and rushing to get contracts from paying entities like the U.S. Marines and U.S. Army via tweaked studies and ornamental-appearance tweaks. 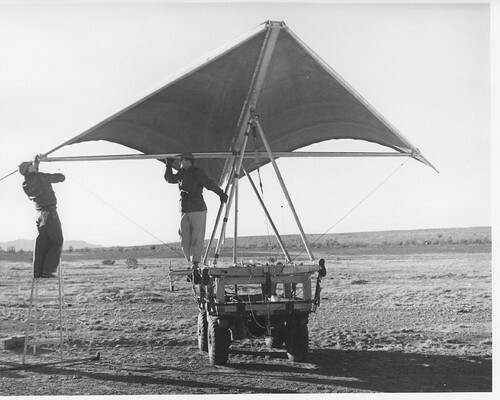 And at the 1961-December juncture another team was readying versions of the Paresev hang glider for piloted test flying... starting flights Feb 1962. Palmer and Hobson seeded starkly foot-launch hang gliding for the renaissance. Craigo was part of the seeding process by his good works and show and tell. When a tree has grown, sometimes it is difficult or impossible to find the seed around that formed the tree; and the nutrients that fed the tree are melted into the wood. Refuse to let such rich core be stolen by a GH-JD team that got disgruntled for the Bills not paying dues; emotions form some history, but do not establish "invention" valid rights; JD, "tear down that GH wall: that prevents you from having a true story clean!" ... and Reagan might say. 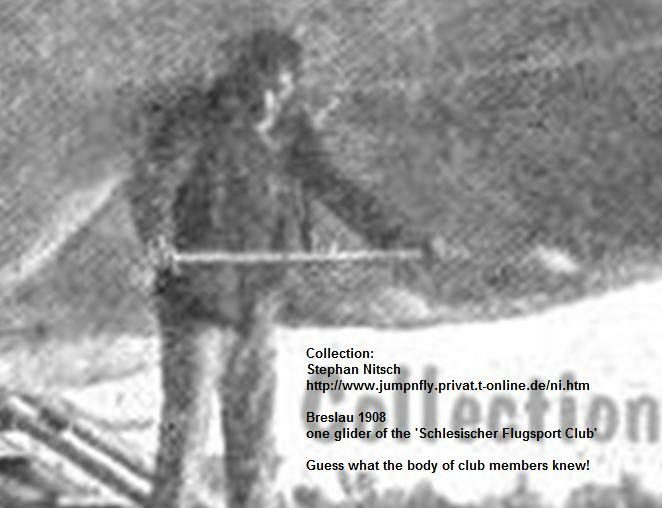 Schlesischer Flugsport Club, 1908, Breslau.